If you're looking for smartphone apps that pay real cash fast, you've come to the right place. While there are a ton of smartphone apps out there that offer pretty great rewards, you might realize that sometimes you have to wait quite a while before your funds or points are redeemable. I generally recommend having a lot of eggs in your basket and signing up for plenty of survey panels and rewards sites so you can create a steady stream of extra income or gift cards, but sometimes it's nice to be able to access your rewards when you need them. And because apps are so popular now, I thought it would be a good idea to make this list for you. 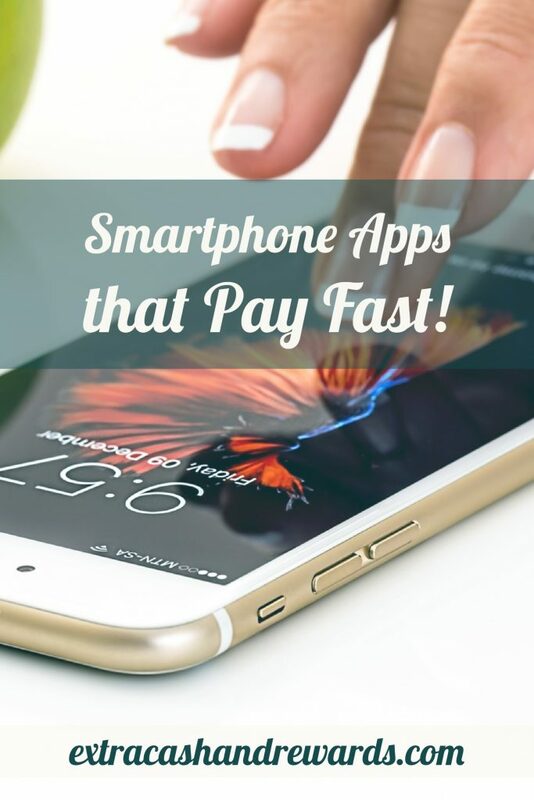 For those of you who spend a lot of time on your phone, check out this list of smartphone apps that pay fast. And when I say fast, I mean within a few days or even instantly in some cases! Ibotta is a shopping app that offers basically instant payments once you hit the cash out minimum. The app has tons of offers from many popular stores and restaurants you've probably heard of, including grocery stores — and who doesn't have to use those? Once you've selected offers from your preferred store, just buy those items, scan them, and take a photo of the receipt using the Ibotta app. Then, just upload it. In most cases, everything you submitted gets approved pretty quickly, and all of those savings are deposited into your Ibotta account. When you hit the minimum amount to cash out (currently set to $20), you can get your funds within a day or less through PayPal or Venmo, or you can choose one of their many gift card options. They have Amazon, eBay, Starbucks, and more for gift cards. Go here to get signed up for Ibotta, or read our Ibotta app review first. Swagbucks — one of the most popular rewards sites on the web, hands down. You can play games, fill out surveys, participate in offers, search the web and tons of other things to earn the minimum 500 SB, their form of currency, required to cash out for a $5 gift card. You'll usually have access to your gift card within about 48 hours though they say that it can take up to 10 days. I've been a member at Ibotta for a long time, and can vouch for the fact that they do pay. Go here to sign up or read our Swagbucks review for more detail first. If you're looking for instant rewards and enjoy surveys, this is a good app to download. Users report hitting the $10 minimum requirement to cash out quickly. After cash out, the code arrives immediately. Go here to sign up for Quickthoughts. Qmee is one of my personal favorites, and I've been a member for quite a while. At first, Qmee was a browser extension for Chrome. Since then, it's expanded! You can still use it as a browser extension, or you can download the app for filling out surveys and getting access to coupons. The best thing about Qmee is that you only need a penny in your account if you choose PayPal as the payment option to cash out. Otherwise, Amazon, Starbucks or iTunes gift cards are available at just a $5 cash out amount. And if you're feeling generous, you can choose to donate your funds to charity instead. Go here to sign up for Qmee or read our Qmee review first to learn more. Good luck, and please feel free to let us know in the comments if you've found any other apps that pay cash fast!